"And so Pilate, willing to content the people, released Barabbas unto them, and delivered Jesus, when he had scourged him, to be crucified. And the soldiers led him away into the hall, called Praetorium; and they call together the whole band. And they clothed him with purple, and platted a crown of thorns, and put it about his head,  And began to salute him, Hail, King of the Jews! And they smote him on the head with a reed, and did spit upon him, and bowing their knees worshipped him. And when they had mocked him, they took off the purple from him, and put his own clothes on him, and led him out to crucify him. " The books of reference used for this study of the book of Mark were the Bible, King James Version, called "The Companion Bible", Publisher Kregel; Strong's Exhaustive Concordance of the Bible, numbered to the Hebrew, Chaldee, and Greek, and English, coded to the Strong's Concordance numbers. "The Forerunner, John the Baptist [1-8]." "The Baptism: with Water [9-11]." "First Period of Ministry, Calling the Disciples [12-20]." "Second Period of Lord's Ministry, His Person, Teaching and Miracles." "Jesus Healing the Sick [1-12]." "The Call to Levi (Matthew), the Feast [13-22]." "Teaching Disciples, "Lord of the Sabbath" [23-28]." "The Lord's Teachings, Parable of the Sower [3-9]." "Jesus Alone with Disciples, Giving Answers [10-25]." "Parable of the Seeds [26-34]." "Tempest of the Sea, Stilled [35-41]." "Demons and the Swineherds [11-17]." "Miracles, Healing of Jairus' Daughter [22-43]." "Mission of the Twelve [7-13]." "Herod Accuses Jesus of being John, Risen from the Dead [17-29]." "Teaching and Miracles of Jesus [30-56]." "Teaching of the Pharisees, their Condemnation [1-23]." "The Miracle, the Syrophenicain Woman [25-30]." "Miracle, Deaf and Dumb Man [32-37]." "Feeding of Four Thousand [1-9]." "Teaching. Pharisees and Disciples [10-21]." "Sufferings and Glory Fore Shone, and explained [1-13]." "Discipleship, Speech, Answer and Reason [33-50]." "The Rich Young Man [17-24]." "Miracle of the Blind Man [45-54]." "Fourth period of the Lord's Ministry, the Rejection of the Kingdom." "Jesus Christ's arrival at Bethany [1-7]." "Jesus entry into Jerusalem [8-14]." 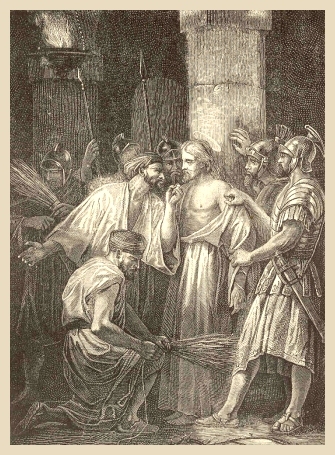 "Jesus Christ in the Temple [15-33]." "Parable of the Vineyard [1-11]." "Pharisees' Question on Tribute [12-17]." "Second Supper, Second Anointing [1-10]." "One Day Before Passover 12-25]." "The agony, Mount of Olives, Gethsemane [26-42]." "Conspiracy and Betrayal, Judas [44-52]." "The Lord Examined before Caiaphas, False Witnesses [55-64]." "The Lord Before Pilate [2-15]." "Personal Abuse of Christ [16-23]."